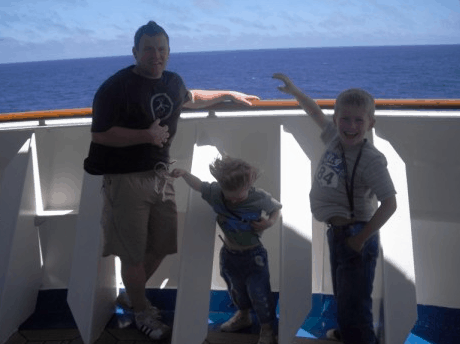 I just adore this photo, it was taken in 2009 on the Grand Princess at sea off the coast of Naples. The Boys loved walking around the promenade deck, especially at the aft of the ship, where the wind was always very high. I love the look of excitement on their faces. And just look at Joe’s hair? They used to get so excited. But I remember panicking when Chris let go of Joe in case he blew off the ship he was so tiny. Just looking at that beautiful sea in the distance makes me feel so calm. There is nothing more peaceful and beautiful than standing at the aft of a ship watching the surf. And if you are lucky the odd dolphin swimming by. Next Post Whats in my Handbag? Looks lovely. And love that hairdo! I went on a cruise with my parents when I was nine. I’d love to go with my husband and the kids.